Urdu, the lingua franca of India and the National Language of Pakistan is a language composed of Hindi, Persian and Arabic. Hindi supplied all the important grammatical rules, especially the declension of the verb, pronoun and noun. The characters and the systems of writing are borrowed from Persian and Arabic. Urdu is a modern language. It had taken its birth in the market of encampment in the period of Muslim reign in India. Urdu is an Arabic word which means market of encampment. It is called Rekhta, Hindustani, Dakini ect. The colloquial Urdu became a beautiful poetic language in the south in the period of Bahmini reign and was spreaded throughout India. It has very rich literature. There is a misunderstanding among the people that Urdu is a language of Muslim Religion. Really it is not. There are so many muslims whose mother tongue is not Urdu and they could not speak or write a word in Urdu and there are some Hindus and Buddhists whose mother tongue is Urdu. There are many Urdu poets and writers who are not muslims. Urdu is a language of common people. 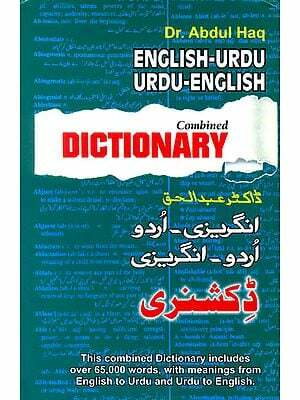 The present book has been prepared with a view of meeting the requirement of all who wish to study Urdu systematically. The rules of grammar has been given in a very simple form and in proper sequence. Sentences have been carefully graduated from simplicity in the form of easy sentences to difficulty in the form of passages. In the first part, Alphabet is set out and then pronunciation explained, while a few reading exercises are added for illustration. These exercises are provided with key transliteration (pronunciation). The second part deals with some classified vocabularies with their pronunciation on useful topics. About 800 word have been given with their pronunciation and meaning. In the third part one can learn to form simple sentences and also the form of conversation on useful topics. The fourth part deals with grammar and contains simple rules. The fifth part deal with some useful sentences, simple letters, small stories and essays. In the last few pages, pronunciation for the fourth part and fifth part have been given. Thanks are due to all who contributed help, specially to Janab M. Bilal Ahmed of Hyderabad and Sri Jagdish Chandar Sachdev of Madras who have laboured hard to revise the entire manuscript and to the Publishers, the Printer ad the very able Urdu Artist Janab Kathib Yacoob, all of whom devoted great care to the making of this book. We are pioneers among the publishers of several language books under the banner of "National Integration Language Series". By this, one can learn the other languages through one's own mother tongue or English. So far, we have published Malayalam, Kannada, Telugu, Hindi, Sanskrit, Oriya, Marathi and Bengali Self-instructors. Although there is diversity among people residing in this Sub-continent because of the many languages spoken by them, there is unity in thought. Basically our culture is one. With great pleasure we are now bringing out "Learn Urdu" through English. A learned and experienced author has taken much pains in compiling this book for beginners. One can easily learn the alphabet, words and proceed with construction of small sentences, translating from Urdu to English and vice versa. Our language series has won appreciation not only from social, political, and cultural organizations, but also from foreigners. We feel happy for having done a bit of service to the solidarity of our Nation. i am from indonesia, how can i order this book? I am awaiting my copy to arrive by mail. I am 75 years old and have doubts as to whether I can learn th4e Arabic alphabet, but I understand that many communicate in "Roman Urdu", so I'm hoping to learn at least that.